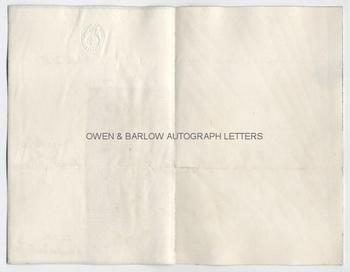 EDWARD R. RUSSELL Autograph Letter Signed. ALS. 1p and integral blank leaf. House of Commons. March 20th 1886. To [William] Woodall. Together with a fine contemporary portrait photograph. The letter is in the form of a press cutting, written by Edward R. Russell, which he identifies as being from the Liverpool Daily Post of 22nd March 1886. It it he praises William Woodall and gives an account of the dinner given by the Savage Club to celebrate Woodall's "elevation to office" (presumably as Financial Secretary to the War Office). Present at the dinner were many prominent men and the entertainment was many and various including Mr. Townley (comic ditties), Mr. Hargitt (piano) and Mr. Bertram (card tricks). 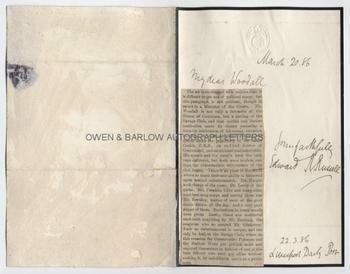 Russell has pasted the cutting to the letter and added the salutation, date, subscription and identifying legend. 8vo. Approx 7.5 x 4.75 inches. Mounting residue to verso of integral blank leaf but the text leaf is in fine condition. 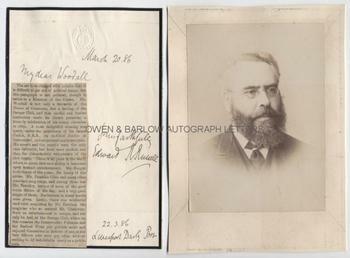 The portrait is an original 19th century gelatin silver print photograph showing Erward R. Russell, head and shoulders in vignette. It measures approx 5.75 x 4 inches (excluding mount) laid down on card from album leaf. It has mounting damage to verso of card but the photograph is in fine condition. Edward Richard Russell was one of the most prominent newspaper men of his day. He was editor of the influential Liverpool Daily Post for almost 50 years and under his editorship it rose to become possibly the most powerful of the provincial dailies. 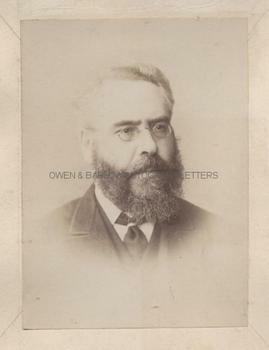 Edward R. Russell was a prolific correspondent and his correspondents included ANNIE BESANT W.E. Gladstone and H.H. Asquith. From 1885-87 he was M.P. for Glasgow and in 1919, a year before his death, he was raised to the peerage as Baron Russell of Liverpool. Both the photograph and the letter are from a 19th century collection made by the radical Liberal M.P., William Woodall.